I’m going to be on Food Network? 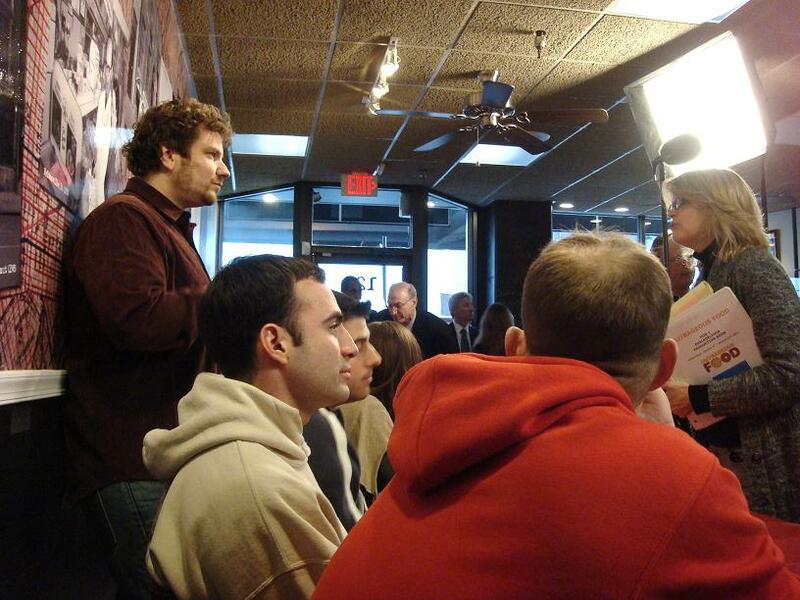 I’m pretty sure I’ve mentioned Food Network in at least half of my posts, so it should come as no surprise I dropped everything last week when my friend, Jay, e-mailed me about a show taping at a local sandwich place: Jake’s Sandwich Board on 12th Street in Philadelphia. I took the notification — “We will be filming all day on Thursday, but opening our doors to everyone during some of the filming around 3 p.m.” — to mean the crew would get some B-roll and be on its way, but what we walked into was a full-out filming of an “Outrageous Food” episode about the eatery’s Five-Pound Philly Challenge, and they let us sit in on the entire thing. If you’ve never seen the show, it’s almost as if “Diners, Drive-Ins and Dives” procreated with “Man V. Food.” The host, Tom Pizzica, travels the country in search of ridiculous foods a la Guy Fieri, but often pits locals against restaurants’ ludicrous food challenges, like the 105-pound burger and the 72-inch burrito. At Jake’s Sandwich Board, the challenge consists of an assortment of tasty Philly staples: a two-foot cheesesteak, four Philly soft pretzels, 12 TastyKake Krimpets, 24 Peanut Chews and one Champ Cherry soda to wash it all down. Oh, and you have to do it all in 45 minutes. To date, only two individuals have successfully completed the challenge (and if you don’t finish in time, it’ll cost you $34.95), so to make the episode a little more interesting, “Outrageous Food” filmed two teams of three (boys v. girls) taking on the feat. I won’t spoil the outcome, but what remained of the losing team’s plate is pictured at the left. Tom Pizzica was hilarious, and the entire production was so much fun. Oh, and did I mention how incredible the sandwich I ordered was? 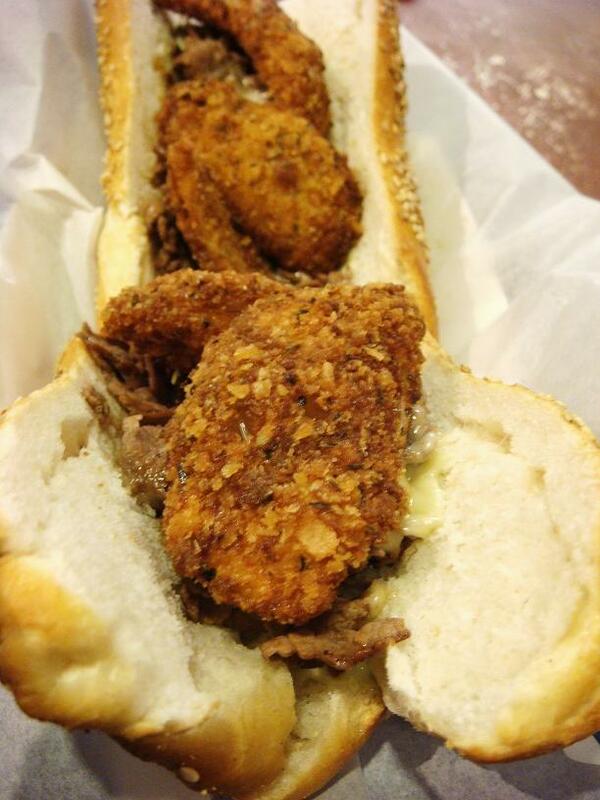 The Philly Wasabi — rib-eye steak, wasabi spread, American cheese and crunch onions. Yup. And based on the few bites I had of Steve’s Village Turkey sandwich and how drool-inducing the two-foot challenge cheesesteak was, I can’t imagine this place puts out anything short of amazing. I highly recommend you check it out. Posted on January 11, 2011 January 20, 2011 Categories foodie stuff, notes REMOVE6 Comments on I’m going to be on Food Network? is The Oatmeal stalking me? A few months ago, one of my friends posted a link on Facebook to a comic/etc. site called The Oatmeal, and I’ve been hooked ever since. I shared this little gem about Mac in my office, and the addiction spread. I can always tell when my co-worker, Stef, is taking an Oatmeal break because I hear a few chuckles and then fits of giggling coming from her cube. Yesterday, The Oatmeal posted this comic: “Why I Don’t Cook at Home.” This is exactly what my kitchen adventures look like (except that whole being a giant white blob thing). Posted on November 11, 2010 November 13, 2010 Categories notes REMOVELeave a comment on is The Oatmeal stalking me? Um, what? 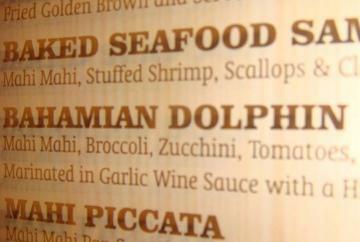 It’s one [questionable] thing to have dolphin on the menu, but why would you advertise something that’s not dolphin as such? And who the hell orders this? Is there something I’m missing here? Posted on October 20, 2010 Categories foodie stuff, notes REMOVELeave a comment on dolphin?